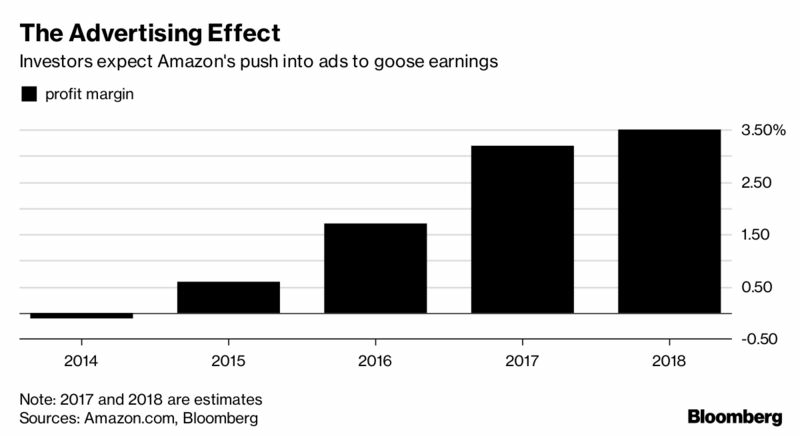 Amazon may have the biggest audience exclusively focused on commerce, dwarfing Facebook and Google, whose users often have other pursuits in mind. 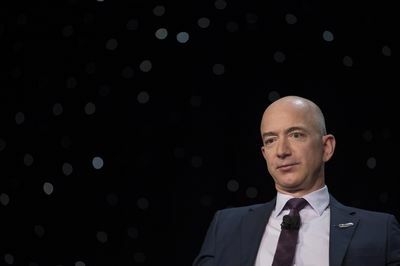 For more than two decades, Jeff Bezos has famously sacrificed profit for growth, persuading Wall Street that Amazon.com Inc. was best served pouring money into the logistical nuts and bolts that have turned his company into the Wal-Mart of the web. More recently, investors have found solace in the company’s profitable cloud services business, which has helped offset losses in e-commerce. Still, for the past five years Amazon’s average profit margins have languished at about 1 percent. For years, Amazon kept advertising on the site subtle for fear of alienating shoppers who had become used to choosing what to buy based largely on customer reviews and price. Amazon has been slowly giving more prominent placement to sponsored products in search results, forcing brands to buy ads to win top billing. It’s easy to see why. By 2021, advertising on websites and mobile devices will account for half of all ad spending in the U.S., capturing greater share than television, radio, newspapers and billboards combined, according to EMarketer Inc. Advertisers are paying attention. Just as big brands pressed their ad agencies a few years ago to devise plans to get the best bang for the ad buck with Google and Facebook, they’re now demanding an “Amazon strategy.” In November, ad giant Omnicom Group set up a specialized operation just to direct ad dollars to e-commerce, particularly Amazon, which has forced consumer brands to re-evaluate marketing decisions. “It's wreaking havoc on traditional retail models,” says George Manas, president of Omnicom's Resolution Performance Marketing. influences purchasing decisions elsewhere, similar to magazine advertisements or billboards, the people said. 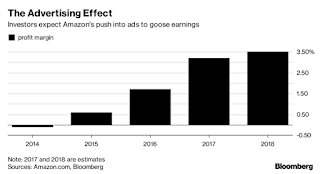 It is increasing its investment in a data team tasked with measuring how advertisements on Amazon generate sales beyond Amazon, one of the people said, since that is more difficult to measure than advertisements on Amazon that directly result in sales. Future advertising products could include buying products within Amazon Video programs, using the “X-ray” feature that currently lets viewers learn more about a particular actor during a show, according to two people familiar with the matter. And while Amazon maintains it won't sell advertising on its voice-activated Alexa platform, advertisers are inquiring given the buzz around its Echo digital assistants, two people said. 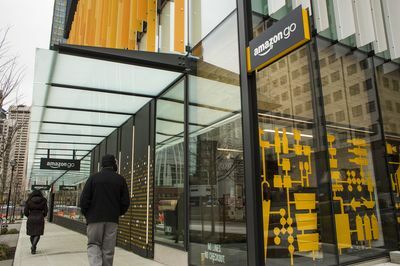 Pedestrians walk past the Amazon Go grocery store in Seattle.